Engage - An enhanced start menu replacement. bookmarks, web sites, shutdown, and search engines are all just a few keystrokes away. And, Engage will organize your programs for you automatically! Works with Windows 98, ME, 2000, XP and Vista! Want to see more of Engage? 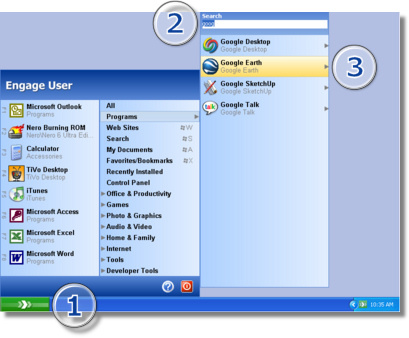 Programs - Can be accessed by name or type, and are displayed using the “large” icons to help you find them more easily. Search engines - Use the predefined searches to quickly find what you are looking for, or easily create your own custom searches. Web sites - Simple and fast way to go to a site. No need to type “http”, “www” or even “.com”. And once you’ve been to a site, you only need to type a few letters to get to it the next time. Documents - Quick access to anything in “My Documents”. Favorites/Bookmarks - Access all your favorites or bookmarks from multiple browsers in one place. Fast Launch - Keep your most used programs readily available with automatically assigned shortcuts. Free 30 day trial. Download now! Special Offer: Get up to 50% off! Get more information. Copyright © 2008 LyricCode Software. All rights reserved.